A review of global research carried out by the Children’s Investment Fund Foundation, the UK’s largest private philanthropic foundation, demonstrates that children who receive a quality early years education perform better in primary school, are less likely to enter criminality, and delay having children for longer. Early years education gives a return on investment of 33:1 – no other education intervention comes close – (Source:Psacharopoulos, 2014). The reasons for this relate to the pace at which a young child’s brain is developing. The area of a child’s brain that supports the skills needed for learning, and the ability to read, write and calculate with numbers only begins to develop from the age of three, and has fully developed by age eight. This makes the period when a child is four and five years old absolutely critical for beginning to learn the reasoning and cognitive skills needed to succeed at school and in later life. 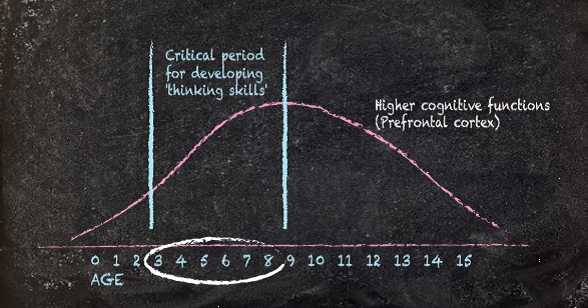 This striking graph, adapted from the world’s foremost medical journal, The Lancet, shows how the cognitive functions of a child’s brain develop from birth to age 15. The style of learning being introduced by the Ghana Education Service, which is activity based and involves learning through play, is proven to build the skills and confidence children need to succeed at primary and secondary school.